The grazer-periphyton and piercer-macro-phyte linkages (Figure 8.8) are the principal pathways for the ingestion of living primary producers by invertebrates. The latter refers primarily to the microcaddis flies (Hydroptilidae), which pierce individual cells of algal filaments and imbibe cell fluids (Cummins and Klug 1979). Descriptions of the grazing pathway typically focus on attributes of the periphyton mat and the mode of invertebrate herbivory. The periphyton, comprised mainly of diatoms, green algae, and cyanobacteria, are found almost everywhere in running waters (Chapter 6). The extent of herbivory varies with algal growth form and differs among the major taxonomic groups for reasons that we shall consider shortly, but it appears that virtually all serve as food for some grazing animal. mandibles of hydroptilid caddis larvae, and so on. These are described as scrapers, grazers, and piercers, respectively. Other FFGs likely ingest plant matter occasionally. 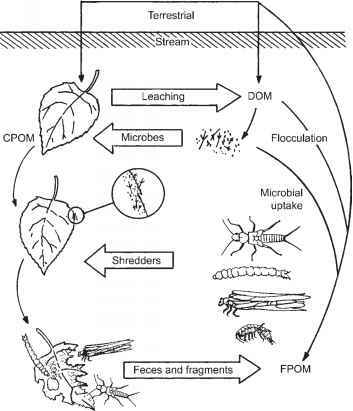 Collector-gatherers surely consume loose algae along with microbes and detritus (Lamberti and Moore 1984), and shredders benefit from the presence of an attached flora growing on the surface of fallen leaves (Mayer and Likens 1987). Drifting diatoms and algae also are captured by suspension feeders, especially those taxa possessing fine sieving devices (philopotamid caddis flies, some chironomid and black fly larvae), and even the relatively coarse meshes of most hydropsy-chids retain some diatom and algal cells. Indeed, within the North American insect fauna, consumption of algae has been noted in at least six orders and 38 families (Merritt and Cummins 2004). Moreover, the composition of an herbivore's diet changes with many factors, including age, season, food availability, and location (Lamberti and Moore 1984). A detailed study of the functional morphology and feeding behavior of the mayfly Stenonema interpunctatum, which is usually classified as a scraper although it also is considered a gatherer, illustrates the difficulties of categorizing feeding roles. Using a flow-through chamber, video, scanning electron microscopy, and even constructing a moveable plastic model of its mouthparts, McShaffrey and McCafferty (1986) observed that several feeding modes were employed depending upon feeding conditions. For attached material such as algae and diatoms, a series of movements of the labium and maxillae comprised a brushing cycle. A collecting cycle occurred in the presence of loose detritus and involved similar feeding movements, but mouthparts were not pressed as tightly against the substratum. Moreover, in the presence of abundant suspended particles, S. inter-punctatum radically altered its behavior, using the apical setae of extended maxillary palps for passive suspension feeding. Only the labial palps and tips of maxillary palps of S. interpuntatum can reach the substrate, and these are setose rather than sclerotized, so scraping is the one feeding mode that does not apply. McShaffrey and McCafferty (1986) prefer the term "brusher" for taxa that remove material from the substrate using setae, and suggest that "scraper" be used only for taxa with hardened structures that can remove adherent material. Just as animals differ in their mode of feeding, members of the periphyton differ in a number of ways that affect their overall vulnerability to particular herbivores. Benthic algae vary markedly in growth form and mode of attachment as well as in overall size (Figure 6.1), and this must affect their availability to particular kinds of grazers. For example, field manipulations of grazer densities in a California stream established that the mayfly Ameletus with collector-gatherer mouth-parts was most effective with loosely attached diatoms. In contrast, the stout, heavily sclero-tized mandibles of the caddis Neophylax were effective against tightly adherent diatoms (Hill and Knight 1988). Filamentous algae apparently are difficult for grazing insects to harvest or digest, and so they are consumed principally as new growths (Lamberti and Resh 1983, Dudley et al. 1986). To the snail Lymnaea, however, possessing both a rad-ula for their harvest and a gizzard for their mechanical breakdown, filamentous green algae provide a very satisfactory diet (Calow 1970). The assimilation efficiencies of herbivore-detritivores fed different diets are a useful measure of the wide range of nutritional value of various foods. Based on a review of 45 published values for 20 species of aquatic insects, assimilation efficiencies range from 70% to 95% on a diet of animal prey, 30% to 60% for a variety of algal and periphyton diets, and from 5% to 30% on a diet of detritus (Pandian and Marian 1986). Considerable variation can occur even for a single species feeding on periphyton. Assimilation efficiencies for the snail Juga silicula were as high as 70-80% when first added to laboratory streams, but values declined during the course of the study to as low as 40% (Lamberti et al. 1987). This coincided with a shift in composition of the periphyton from diatoms and unicellular green algae to filamentous green algae and cyanobacteria. The decline in assimilation efficiency could be the result of cell senescence and other changes in physiological condition, or a decline in nutritional value owing to succes-sional changes in the periphyton assemblage. The wide range of assimilation efficiencies observed with periphyton diets is at least partly due to their structural and biochemical characteristics. Variation in protein and lipid content and in cell wall thickness likely is responsible for differences among autotrophs in their nutritional value and palatability. A high C/N ratio signals a poor diet, indicating a high cellulose and lignin content and a low protein content; in general C/N ratios should be <17:1 for animal utilization. On this basis, members of the periphyton appear to be generally suitable (C/N ranges from 4 to 8:1), whereas aquatic vascular macrophytes appear to be nutritionally less adequate (C/N from 13 to 69:1) (Gregory 1983). Based upon a correspondence across sites between periphy-ton characteristics and gastropod growth, McMa-hon (1975) concluded that low C/N ratios and high organic content are indicative of a high-quality food resource. Variation in the N content of diets was an extremely effective predictor of assimilation efficiency for twenty taxa of aquatic insects reviewed by Pandian and Marian (1986). Lipid content is another variable likely to influence the nutrition and development of herbivores. Most insects are unable to synthesize polyunsaturated fatty acids and sterols, indicating that the lipid content of their diets is important to food quality. 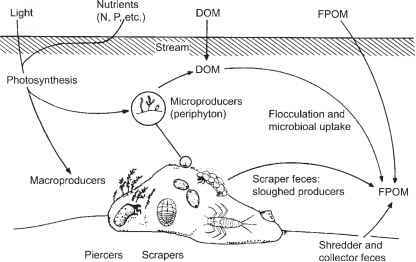 Intense grazing by a snail and a larval caddisfly in laboratory streams altered the fatty acid composition of the periphyton, suggesting that grazing may have been responsive to this aspect of diet quality (Steinman et al. 1987). Cargill et al. (1985) showed that specific fatty acids were critical dietary components to a detritivorous caddis larva, Clistoronia magnifica. Cyanobacteria are considered to be a poor food supply for freshwater plankton feeders (Wetzel 2001) and possibly for periphyton grazers as well. Cyanobacteria may have a high protein content, but other attributes, including a polymucosaccharide sheath rendering cell walls resistant to digestion, perhaps toxins, and a filamentous growth form all detract from their value as food. However, the evidence from lotic grazers is mixed. For example, in laboratory feeding trials the mayfly Tricorythodes minutus ate and assimilated two cyanobacteria, Ana-baena and Lyngbya (McCullough et al. 1979), whereas Asellus and Gammarus would not consume Phormidium (Moore 1975). Orthoclad midges have suppressed blooms by Phormi-dium and Oscillatoria in outdoor channels (Eichenberger and Schlatter 1978). Because studies of cyanobacteria have used primarily filamentous forms rather than colonies or single cells, consumption of the latter is little known. Herbivory generally is of minor importance to freshwater macrophytes. According to Wetzel (2001), less than 10% of macrophyte production is consumed live. The tough cell walls and high lignin content that provide structural support to macrophytes are effective barriers against their ingestion and digestion. Herbivorous taxa belonging to primary aquatic invertebrate groups usually are ineffective grazers of higher plants (Newman 1991). However, decapod crustaceans and certain insects of terrestrial origin can reduce the biomass of submersed and floating-leaved taxa. Several studies have found crayfish to significantly reduce the abundance of submersed macrophytes, although they have no apparent effect on emergent taxa, presumably because of the greater amount of support tissue (Feminella and Resh 1989). Crayfish also cause nonconsumptive loss by clipping shoots of submersed macrophytes, which then float away. In northern Wisconsin lakes, Orconectes spp. altered assemblage structure of submersed macrophytes, primarily because single-stemmed species were more vulnerable than rosulate growth forms (Lodge and Lorman 1987). Intriguingly, the most dramatic effects of invertebrate grazing on living aquatic macrophytes involve herbivores derived mainly from terrestrial insect lineages. These include chrysomelid and curculionid beetles, aquatic and semiaquatic lepidopterans, and specialized dipterans (Newman 1991). At a site in the Ogeechee River, Georgia, infested with the water lily leaf beetle Pyrrhalta nymphaeae (Chrysomelidae), leaves of the water lily Nuphur luteum lasted only 17 days compared to more than 6 weeks at another site where the beetle was absent (Wallace and O'Hop 1985). Some macrophytes, including the water hyacinth Eichornia crassipes and the kariba weed Salvinia molesta, can become so abundant that they present serious weed control problems worldwide, particularly in the subtrop-ics and tropics. A Brazilian beetle that feeds on kariba weed is one potential agent of biological control (Barrett 1989).